The future of consumer goods is moving toward a connected ecosystem that provides true 1-1 personalized experiences for consumers, distributors, wholesalers, and retailers. It’s time to embrace the future and gain your edge over the competition. 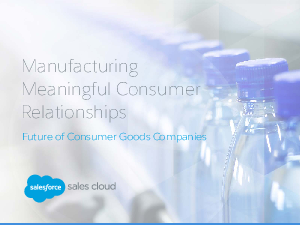 Read on to see how consumer goods companies around the world are changing the game by quickly innovating, building in agility through technology, and deepening relationships with their customers and consumers.